On July 7th 2005, my brother (Andrew Abernethy) was onboard one of the Tube Trains involved in the London Bombings. He suffered numerous wounds and needed medical attention to remove shards of glass from his body. However, he was ultimately one of the lucky ones. Upon finally escaping from the tube, he was one of the first to give an interview to BBC television and radio. Many of you saw or heard that interview, both in the UK and overseas, and got in touch to express your concern. Thank you for that. Unfortunately, many others were not as lucky as my brother and I'd like to express my deepest sympathies to all those who lost loved ones in this tragic event. As martial artists, a key part of our study is how to protect ourselves from dangerous situations. But is there anyway in which we can protect ourselves from bombs and other instruments of terrorism? The awareness that effective self-protection and martial arts training develops can certainly help. Sometimes we are unfortunate enough to be in the 'wrong place' at the 'wrong time' and it can be difficult to see what anyone could have done to change the outcome. However, if we maintain a constant state of vigilance we will undoubtedly stand a better chance of spotting potential acts of terrorism and therefore making things safer for ourselves and all those around us. Awareness is some thing we should all have; fear and paranoia is something we must avoid. The terrorists who carry out such appalling acts wish to promote fear and it's vital we never allow their actions to have any kind of effect. Lawrence Kane - a martial artist for over 30 years - has written a superb piece on awareness and what to look out for with regards to potential acts of terrorism. The piece also makes the important distinction between a healthy vigilance and awareness, and a thoroughly unhealthy fear and paranoia. I'm very grateful to Lawrence for kindly offering to share this superb and illuminating piece with members and visitors to this website. Publicity surrounding the recent attacks on the London transit system combined with statements by security professionals and government authorities that it is impossible to completely guarantee safety in an open society may lead many to feel helpless in the face of terrorist threats. After all, no matter how well trained a martial artist you are; you simply cannot fight a bomb or a bullet with your hands or feet and expect to survive unscathed. It is natural to be fearful, yet truly not necessary. There things you can proactively do remain safe from such attacks. Awareness of timing has to do with the time of day during which attacks are most likely to occur. Terrorists are very conscious of media attention, timing attacks carefully to achieve the highest possible level of public impact. Consequently, attacks typically occur during "rush hour" when and where the highest numbers of potential victims are congregated. For example, the April 19, 1995, Oklahoma City bombing and the September 11, 2001, attacks in the United States all took place during the workday. Similarly, the London subway and bus bombings on July 7, 2005 and the Madrid train bombings on March 11, 2004 also took place during peak traffic hours. A crowded mall in daytime, therefore, is much more likely to be hit than the same location late at night or just before closing simply due to the presence of more potential victims during the day. Terrorist threats are frequently indirect, delivered via remote explosives rather than via direct personal attacks. Unlike a typical mugger or common criminal, these folks are looking to cause as many casualties as possible with the least amount of effort. It's hard to create mass havoc through one-on-one attacks. When traveling through public places or using public transportation it is prudent to look for and report any suspicious or unattended packages, devices, or baggage that could be used to deliver an explosive charge. There are many instances where alert civilians have been able to thwart potential remote bombing attacks. For example, on January 23, 2005 a young boy playing in the village of Barangay Malisbong, an Abu Sayyaf stronghold in the Philippines, discovered a powerful explosive device concealed in a two-liter plastic soy-sauce container packed with shrapnel and rigged to a timing device. He reported his discovery to the authorities who disarmed the weapon and subsequently arrested two terrorist suspects. Similar devices were retrieved unexploded from a packed public market in Midsayap and the Cotabato City Cathedral the next day. • Hidden or abandoned packages of any kind, including large items left in garbage containers. • Packages that are connected to wires, timers, tanks, or bottles. • Items that appear to be releasing a mist, gas, vapor, or have any unusual odor. • Packages containing canisters, tanks, metal boxes, or bottles. Vehicles can be suspicious too. They are, after all, frequently used to deliver explosive charges (e.g., Oklahoma City bombing). Once again, there are many instances where alert civilians have been able to thwart potential vehicle bombing attacks. For example, on February 28, 2005 an astute villager in the city of Arabe notified Israeli security forces of a commercial truck with a long cable protruding from it. Upon closer examination, the cable was attached to a battery and a video camera, most likely intended to document an impending terrorist attack. IDF forces discovered a large amount of explosives packed in the back of the vehicle which they subsequently detonated in a controlled manner to dispose of the threat. • Mismatched or precariously hung license plates. • Attempts to abandon the vehicle in an inappropriate spot near a high value target. • An extra heavy load in the back. • Attempts to evade roadblocks or security checkpoints. • Refusal to slow down or comply with legitimate commands by law enforcement authorities or security personnel. In addition to remote explosive devices or vehicle-delivered bombs, suicide attacks can also be a concern. This tactic has been used by Al Qaeda, Hamas, Islamic Jihad, Hezballah, the Kurdistan Worker's Party, and the Tamil Tigers, among other groups, affecting countries such as Afghanistan, Algeria, Argentina, China, Colombia, Croatia, Egypt, India, Indonesia, Iraq, Israel, Japan, Kenya, Kuwait, Lebanon, Morocco, Pakistan, Panama, the Philippines, Qatar, Russia, Saudi Arabia, Sri Lanka, Tanzania, Tunisia, Turkey, Uzbekistan, and Yemen. • Unseasonable dress, particularly when conspicuously bulky. • Protruding bulges or exposed wires under clothing, potentially seen through the sleeve. • Attempts to wear a disguise or blend into a crowd where the person does not seem to belong. • Repeated and nervous handling of fashion accessories or clothing. • Slow-paced movements with intense focus. • Profuse sweating in excess of what might be expected due to environmental conditions. • Nervous muttering, mumbling, or praying. • Attempts to maintain distance from or otherwise avoid security personnel where present. • Exuding a faint chemical odor. While awareness can help you avoid terrorist attacks altogether, it can also help you thwart one before it can be pulled off successfully. Because the trained martial artist is far better prepared than the average citizen to take action in these cases, we should be prepared to intervene when necessary. Prudent application of countervailing force can be very effective. For example, on March 8, 2002 a Palestinian youth in his 20s walked into the crowded Caffit coffee house in Jerusalem and asked for a glass of water. This was nothing unusual as that particular part of town was a popular hangout for Palestinian teenagers many of whom frequented the café. What was unusual, however, was the fact that he was carrying a large black school bag, appeared nervous, and was sweating profusely. An astute waiter, Shlomi Harel, became concerned by the youth's behavior, noticed a suspicious wire leading from the backpack, and took immediate action. Pushing the youth outside, Harel and a security guard who also worked in the building snatched the bomb from the assailant's hands, yanked the wire from the detonator, wrestled him to the ground, and held him until police could arrive. Their quick action averted what Police Chief Mickey Levy said would have been, "a major disaster." Terrorist attacks are, by definition, terrifying. It is easy to feel hopeless in the face of such danger yet it is also possible to hone your sense of awareness, identifying and avoiding peril before it becomes too late. Good situational awareness means having a solid understanding of time and place and how they relate to you, your family, friends, and others around you at any given moment. Any time you are near others, especially strangers, you must be vigilant. If you can sense danger before stumbling across it you have a much better chance of escaping unscathed. While the odds of encountering a terrorist bomber are remote, a refined sense of awareness can be beneficial in any type of hazardous encounter, be it with a person, place, or thing. Violence almost never happens in a vacuum, after all. There is always some escalation process-even a really short one-that precedes it. Consequently there are always physiological, behavioral, environmental, or verbal indicators that you can spot to warn you of imminent peril. By constantly surveying and evaluating your environment, you achieve more control over what ultimately happens to you. Lawrence Kane is the author of Martial Arts Instruction: Applying Educational Theory and Communication Techniques in the Dojo (YMAA) and co-author of The Way of Kata: A Comprehensive Guide to Deciphering Martial Applications (YMAA, September 2005). Over the last 30 or so years, he has participated in a broad range of martial arts, from traditional Asian sports such as judo, arnis, kobudo, and karate to recreating medieval European combat with real armor and rattan (wood) weapons. 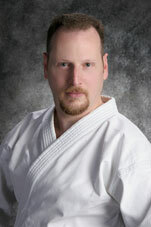 He has taught medieval weapons forms since 1994 and Goju Ryu karate since 2002. He has also completed seminars in modern gun safety, marksmanship, handgun retention and knife combat techniques, and he has participated in slow-fire pistol and pin shooting competitions. Since 1985 Lawrence has supervised employees who provide security and oversee fan safety during college and professional football games at a Pac-10 stadium. This job has given him a unique opportunity to appreciate violence in a myriad of forms. Along with his crew, he has witnessed, interceded in, and stopped or prevented hundreds of fights, experiencing all manner of aggressive behaviors as well as the escalation process that invariably precedes them. He has also worked closely with the campus police and state patrol officers who are assigned to the stadium and has had ample opportunities to examine their crowd control tactics and procedures. Lawrence lives in Seattle, Washington. He can be contacted via e-mail at lakane@ix.netcom.com.